PEM Bunk Matting is the perfect storage for indoor boat storage and marine dry rack facilities – there is really nothing else like it. PEM Bunk Matting is made from a soft thermoplastic material that will help protect the gel coating on the boat’s hull – which means you will not have to worry about scratches or minor damage when unloading boats for the new season. Our matting is also incredibly durable. It is tear-resistant, and is naturally porous, which means that it will not hold water and build up mold and mildew like carpet. And, PEM Bunk Matting lasts for many years – so you won’t have to worry about replacement any time soon. 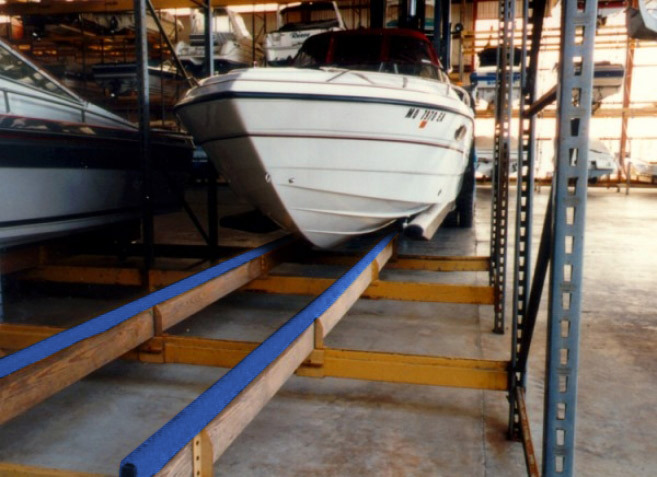 PEM Bunk Matting is a fantastic option for indoor boat storage and dry rack marinas looking for long-term solutions to properly store client boats safely, effectively, and easily. "I have been using PEM Marine Matting since 2002 at the Naples Boat Club, and it works great. It protects the boat bottoms very nice, and allows water to drain, and the boards to breath."